"The Campus Mall lined on either side by White Ash and Sugar Maple" by L. Michael Hill Ph.D. 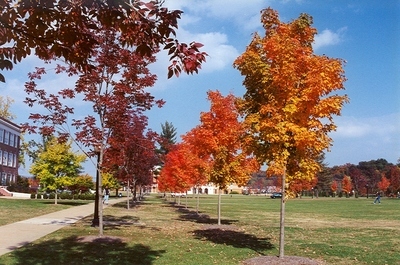 The Campus Mall lined on either side by two species of trees: The White Ash Fraxinus alba (Oleaceae) and the sugar maple Acer saccharum (Aceraceae). The ash tree line is closest to the sidewalk. Bowman is to the left, and the McKinney Center is in the distance.